Happy with your ISP ? Are you happy with your ISP & what average speed do they provide you with ? Yeah I'd say so. 200Mbps download is nice, more than 12Mbps upload would be better though. That being said I'm always using VPNs so I never actually use the full speed and for what I do on the web (watch a view videos, browse a few sites) I don't use it to it's full capacity. It's only really useful when downloading software updates. It's OK, best I can do in my area anyway. Just a bit pissed that across the main road by me, that street can get fibre (like 150Mbps) whereas I'm stuck with crappy 8Mbps cause why not miss out our road....been three years of 'coming soon' so far. I'm the same as Ghoul 200Mbps down and 12Mbps up. I'm not happy with my ISP because of the company I have it through. Comcast is a disgrace to the business community, but they've practically monopolized the entire market. Fortunately, Google Fiber is making its way into Portland. I just hope that it happens fast so I can either go to them or have it shake Comcast up a bit and offer me lower prices. Either way, I'm going to get service through someone cheaper. We have Newwave Cable for internet only (yes, you can get Net without paying for cable TV from a Cable TV company). They are a small company, and when compared to Comcrap, it is tiny. However, when we call, we seldom sit on hold for more than about five minutes, the last time we had an outage, there was a cable truck in our driveway the next morning, and he tested and replaced our modem without bitching about it or having to "call my manager". Last year when lightning took out the feed for our entire neighborhood, they had a fleet of trucks up here that afternoon and service restored by about noon the next day. Try either of those with that other cable company. No. They lately offer sluggish download speeds and isn't acceptable for online gaming (cannot enjoy SG: DeadZone due to lag in the evening.) It's like being on dial-up to be honest. I am going to use the famous hatred say "If I was in a room with Hitler, Bin Laden and my ISP (assuming that my ISP is a person) and I have a gun with 2 bullets, I'd shoot my ISP TWICE"
I guess. They give me free INTERNET. I suppose that'd make anyone happy. As you all must know by now, I have to use a dial up provider. I was using AOHell for years. They started to slow down my speed and it suddenly kept crashing every 10 - 15 minutes. As you all must know by now, I have to use a dial up provider. I didn't know that dial-up is still a thing, even in this generation. I guess it's still prevalent in rural areas and such. Also, I too was a customer of "AOHell" back in the day. 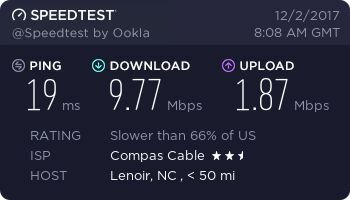 When the thought it was funny to cut my internet completely off just because I didn't update my modem (and I couldn't), it took me the time to finally switch away from them and since then, things have been cool.